Welcome To Delve into Your Finances in 2012! This year, my goal is to pay off my home equity line of credit once and for all! We didn't make much progress in January and February, but March turned out much better! Why? I'd love to credit all my frugal ways, and the money-saving things I did this month did have something to do with how much money we saved. But it doesn't account for most of the progress. And I'd love to say that this blog is bringing in the big bucks. Although I have found new ways to monetize this blog over the past few months, and though it is bringing in more income than it did in the past, the income from the blog is still a pretty small number. No, the majority of the money saved this month was due to increased income - my husband got a bonus at work. Woohoo! It's difficult to reach a goal just by cutting your expenses, because you can only cut a certain amount before you get to items that you simply cannot or will not cut. And if you only concentrate on increasing your income, your expenses could grow at the same time, leaving you no better than you were before. To reach large financial goals, you have to do both. So we have now paid off 15% of the amount we owed on December 31, 2011. Good progress, but still lots to go! How are you doing on your 2012 financial goals? Leave a comment below! Here's a great new coupon for $3.00 off TWO HUGGIES Little Movers Slip-On diapers! Print it out before it's gone! My daughter loves to spread cream cheese on crackers. It's one of her favorite snacks. So I was really excited to find this great coupon for $1.00 off Cream Cheese with one Keebler Toasteds Crackers. You can save even more by using a manufacturer's coupon to purchase the Keebler crackers. Right now the coupon database doesn't show any available, but keep checking for coupons! Looking to save on paying for college? This is a subject near and dear to my heart, as I have a 14-year-old daughter, and college is looming! And if it's been a while since you went to college, check out this great read about what it's like to apply now: Crazy U: One Dad's Crash Course in Getting His Kid Into College. Welcome to this week's Frugal Follies Frugal Tip! Couponing saves lots of money... but it costs money, too. Here's a post I did last year that covers how to save on couponing: Combatting the Cost of Couponing. Check it out! I'm glad I reviewed it, because I've been breaking one of my suggestions. I've been lazy when I print out coupons, and I haven't been making sure that I'm printing coupons on the backs of previously-used paper. I'm definitely wasting paper that way! Note: don't print out coupons on the back of paper on which you printed other unused coupons. If the coupons are from the same site, the coupons might line up, so that you would have a double-sided coupon. That could cause some confusion at the register if the clerk rings up the wrong side! What expenses do you incur because of couponing? How do you cut costs? For more frugal tips, please go to my Linkup Parties page and check out the bloggers listed under Frugal Tips Linkups. There are lots of great ideas on each blog and I'm sure you'll find lots of wonderful tips! Be sure you know what the municipal codes in your area are for putting up signage. Some places restrict what signs you can put up or how long they can appear. If you need a generic sign, check a home improvement store. There are usually many to choose from. Check in your local papers for coupons, or look online for online coupons to that store's online store. If you need a personalized sign, one place to check is print shops at office supply stores. They may have what you need. Look online - do searches on the kind of yard sign you need. Here's a great way to find new things to do to get Swag Bucks! Stop by the Swagbucks Facebook page and click on "Everyone (Most Recent)." You'll find lots of Swagbucks members talking about how they're earning Swag Bucks. Read the conversations and you'll find out about surveys, videos, tasks, and special offers you can do to earn even more Swag Bucks! And remember... until April 3rd, you can join Swagbucks and use the code MARCHSWAG to start with 100 Swag Bucks in your account. Join Swagbucks today to start earning points toward prizes like $5 Amazon.com gift card codes! Would you like to know what's on sale this coming week at the national chain stores? Looking for a different store? Click here for the full list. How many inserts will there be in your newspaper this Sunday? According to the Sunday Coupon Preview, it looks like an amazing week! There will be a total of 5: 2 RedPlum, 2 Smartsource, and 1 Procter & Gamble. So if you buy newspapers for the coupons, this is the week you'll want to buy extra! Check out all the great coupons coming out this week at Sunday Coupon Preview! Need several pieces of large equipment? You might be able to save money by purchasing a skid steer (also called a skid loader). The conventional bucket of many skid loaders can be replaced with a variety of specialized buckets or attachments, many powered by the loader's hydraulic system. These include backhoe, hydraulic breaker, pallet forks, angle broom, sweeper, auger, mower, snow blower, stump grinder, tree spade, trencher, dumping hopper, ripper, tillers, grapple, tilt, roller, snow blade, wheel saw, cement mixer, and wood chipper machine. So just by purchasing one machine and many attachments, you'll have lots of different machines. Save even more by looking for a used skid steer for sale. You can check eBay (yes, they have a whole category devoted to them), Craigslist, or online sites. Be sure to do your homework to figure out what you need and what is a good price range. Buying gold - good idea? Many people buy gold when the future is in doubt. Gold sales really caught fire as the economy melted down in 2008. People were unsure if the future would have high inflation rates, so as a hedge against that, they bought gold. Consequently, gold is near an all-time high now. Personally, I don't think gold is a good investment. Over the long term, despite the big run-up now and busts in other markets, gold returns a lot less than stocks, bonds, or real estate. Now, if you have gold and have other goals, such as getting out of debt, I think it's a great time to sell. Liquidate that gold and use it toward your other goals. But buying? I don't think buying at the top of the market is ever a good idea. However, if you're looking to buy, be sure you're getting the most accurate price and have fees as low as possible. Be sure to search all possible suppliers. For instance, if you want to buy Golden Eagle coins, do an Internet search for "buy gold coins Golden Eagle" to get lots of vendor possibilities. Be sure to check local sources as well. Did you know that in some states, you can choose your own electricity provider? I had no idea about this, as I've never lived in a state where electricity has been deregulated. But in areas of Connecticut, Illinois, New Jersey, and Pennsylvania, among other states, you can choose which electricity provider you want to use. This article gives a comprehensive guide to electricity deregulation. How do you choose which provider will give you low cost electricity? Check the websites of electricity providers in your area. Get out your old electricity bills and figure out how many kilowatt-hours your home uses each month. At many sites, there will be an estimating program that will give you an idea of what your bills will be. Be sure to check for any fees for switching or other monthly fees. If the site doesn't have this information, give a call to their customer service and ask. Also compare these costs to what you're paying now. Once you've figured out which electricity provider is the cheapest for your situation, make the change or stay with your current provider. (Get it - "current" provider? Electrical current?) And you'll save money easily each month, which you can put toward other financiall goals. 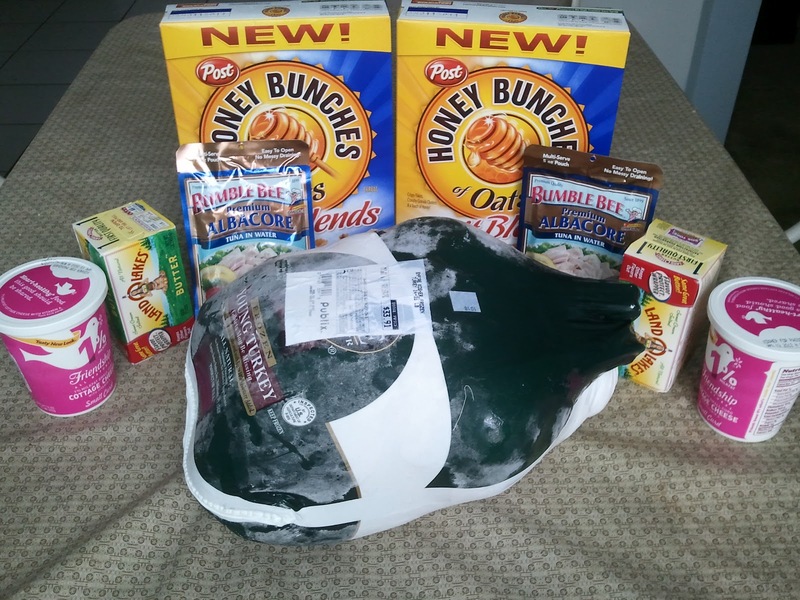 Welcome to Frugal Food Thursday! If you have a great frugal recipe, please link up below! Passover is almost upon us - I can't believe it! Here's a recipe that I often make for my Passover seder - Apple Matzah Kugel. It's a nice sweet side dish, and my kids love it. Here's the original source of this recipe. Preheat the oven to 350 degrees. Break the matzah boards in pieces and place in a large bowl. Cover with hot water and allow matzah pieces to soak. Once they are soft, drain the water from the bowl. In a small bowl, combine the eggs, salt, honey, oil, and cinnamon. Add the mixture to the softened matzahs. Mix in the apples and raisins. With a small amount of oil, grease an 8-inch square baking dish. Pour the mixture into the baking dish. Bake the kugel at 350 degrees for 35 minutes. 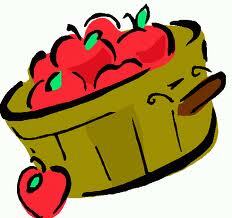 There are lots more cheap recipes posted here at Frugal Follies. Click here for the list! Got a great frugal recipe? Link below to your actual post, not your main page. Please only link up recipes and other food-related posts; contest entries and other posts are not allowed and will be deleted. 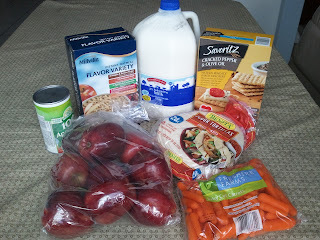 I'd appreciate it if you would link back to Frugal Food Thursday as well! For more great recipes, please go to my Linkup Parties list and scroll down to Food Linkups. There are lots of great recipes on each blog and I'm sure you'll find some new favorites! Here's this week's five most printed coupons from Coupon Network. Have you printed them yet? It's spring now, but you still need to be concerned about colds and flu! In fact, one of my kids was just sick, after not having gotten sick all winter long. So be aware! Swagbucks is welcoming spring with some new collectors' bills! There are five Spring Swag Bucks: Spring Cleaning (7 Swag Bucks), Spring Training (9), Spring Forward (11), Spring Flowers (12), and Spring Break (15). Find them all by April 3rd, and you'll get a bonus 10 Swag Bucks! And remember, if you're not a member of Swagbucks yet, click here and use the code MARCHSWAG when you sign up and you'll get an extra 70 Swag Bucks on top of the usual 30, for a total of 100. And there's still time to participate in March Swagness! Meet the goal set each day and you'll get a 10% Swag Buck bonus. I've met all the goals so far--how are you doing? ALDI: Love the bargain aisle! I took two trips to ALDI (so far) this week. The first trip, I just bought a few basics: one gallon of milk, some produce, and some crackers, among other things. But I should have bought two gallons of milk, because we ran out today! So I made another run over there. And I am sure glad I did! In the last several weeks, ALDI has had theme weeks - Mexican, Italian, and Asian foods were featured, including items that they don't generally carry. Since the theme weeks, those items have been sitting in their bargain aisle, but the prices really weren't all that great. Until today, when I found lots of markdowns! The prices were lower than the same items would be if they were on sale at Publix and I used coupons. It was so tempting to just buy everything! 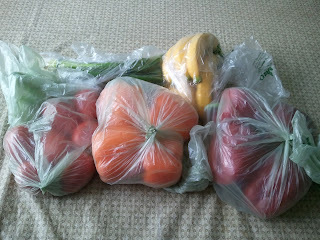 But I held off and only bought the items that I would buy at full price anyway, items that I normally stockpile. It was hard turning down boxed butternut squash risotto and jalapeno cheese crackers, but I managed to leave those items on the shelves. For my Fort Lauderdale area readers: There's another great coupon in today's newspaper! 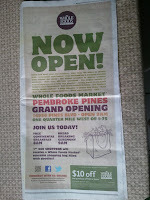 On page 11A of the March 28, 2012 newspaper, there is an ad for the new Whole Foods store in Pembroke Pines. There's a description of its grand opening today. And, most importantly, there is a coupon for $10 off a purchase of $50, good from today through 4/30. 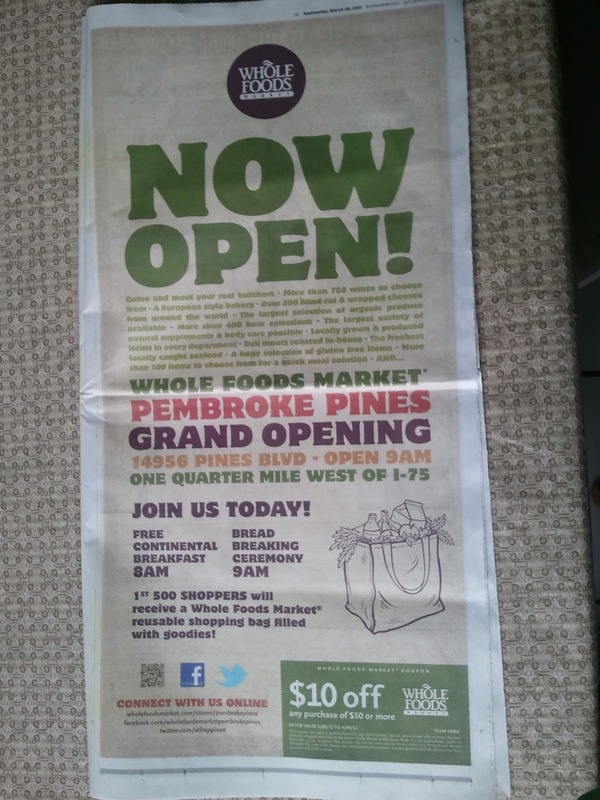 The text of the coupon says it's only good for the new Pembroke Pines Whole Foods. But if your Publix accepts Whole Foods coupons as a competitor, it should work there as well. That's how I plan to use it. In fact, this is such a great coupon, I did something I normally don't do: I bought two more copies of today's newspaper. I rarely purchase extra newspapers for the coupons, but paying $1 for a $10 coupon that I will almost definitely use seems like a good investment to me! 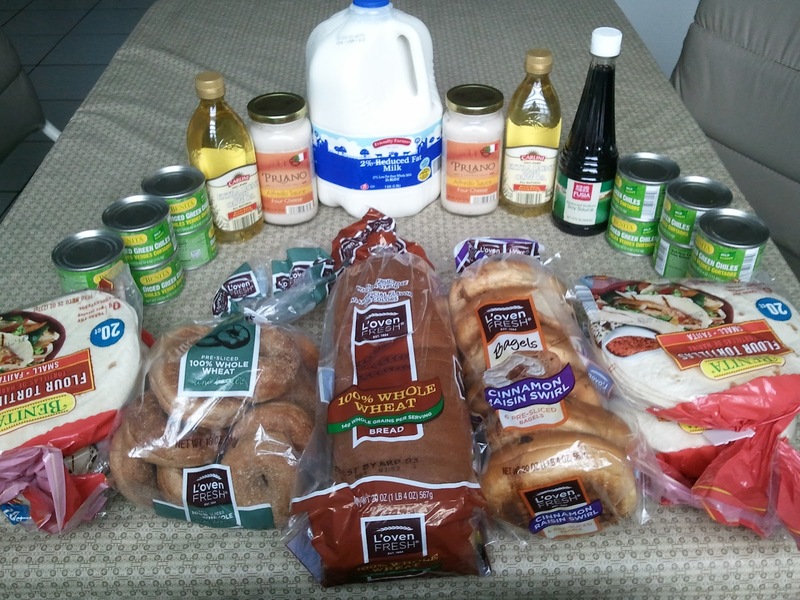 I invite you to link up to your best grocery deals below, to inspire others to save more! Those of you who get amazing deals every single week, I am in awe of you. Sometimes I have a week where I just need to take off the deal shopping. This week was that week. 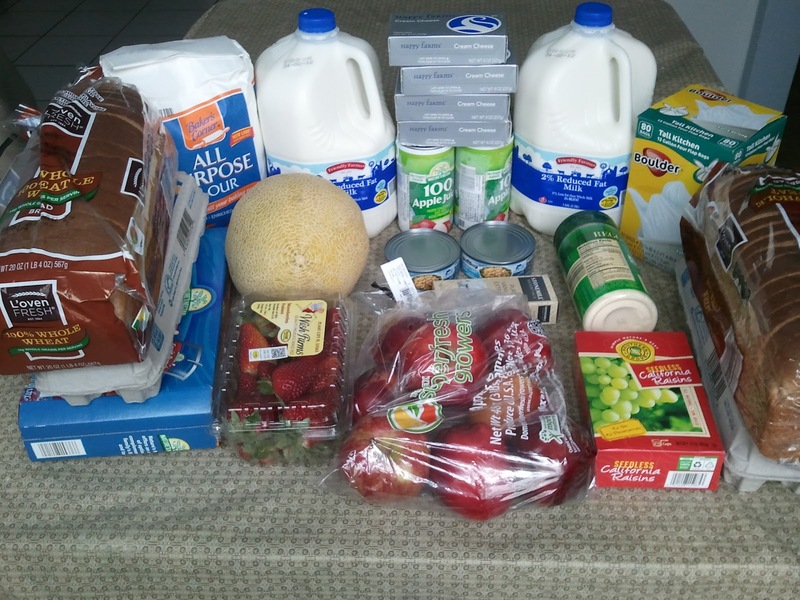 I bought most of the groceries this week at ALDI and Western Beef, with just a quick trip to Publix to pick up a few items on sale and used just a few coupons. I went ever so slightly over budget, but I was well under budget for the past two weeks, so I don't think this is that bad a slip-up. For the year (13 weeks), I spent $939.41 for items which retailed for $1839.13, and saved $899.72, or a 49% savings. That's an average of $72.26 spent each week for a family of five (husband, wife, and daughters ages 14, 11, and 6), including lots of fresh produce, dairy items, and kosher meat. In 2011, I spent $4017.13 for items which retailed for $7344.08, saving 45% and spending an average of $77.25 per week for the year. How did your shopping go this week? What bargains did you get? Please leave a link to your blog post about your weekly shopping. The aim is not to brag, but to inspire! Please link up directly to your post, not to the blog itself. I'd appreciate it if you put a link to Wednesday Weekly Shopping in your post as well. If you don't have a blog, please leave a comment! If you're reading this post via email or a reader, please click here for the links. For more great shopping deals and trips, please check out the bloggers listed in my Linkup Parties page under Shopping Deals Linkups. 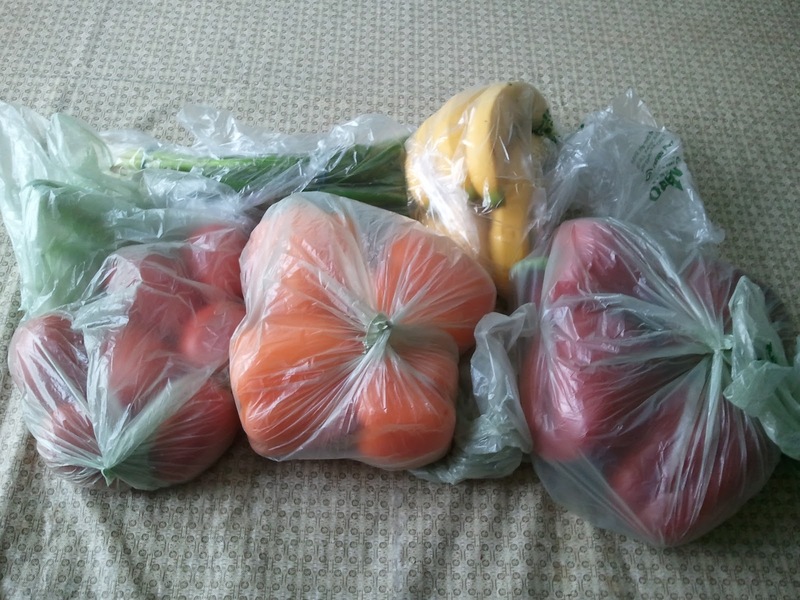 I'm sure you'll find lots of great ideas on saving money on groceries! Clean thoroughly first! Carpet cleaners will often charge extra for rooms that are very cluttered. Clean up your clutter and get everything except the large pieces of furniture off the carpet. And if you can move furniture to another room, even better. Rent a carpet cleaning machine and do it yourself. They still have these at my grocery store - check yours to see if a rental is available. Or call rental equipment companies to see if they have one that you can get inexpensively. Look into purchasing your own equipment if you think you'll use it many times - say, you have a messy pet or hold a lot of parties. Check eBay and Amazon.com, as well as other home products stores. If you go with a company, look in your local paper for coupons. I know that COIT Cleaners often advertise in my paper's coupon inserts. Contact many local companies to get estimates. Be sure to use the Internet - if you're in Durham, North Carolina, search on "carpet cleaners durham nc". Be sure that all the estimates cover the same services so that you can compare them. I love hot green tea. I often buy it at CVS - they regularly have a special on Unilever items, such as Lipton tea. I can usually get green tea for around a penny a bag, making it a healthy and cheap way to start my morning. But I rarely drink it cold... until now! I recently tried two types of bottled green teas from TEAS' TEA, made by ITO EN. This month, ITO EN & Whole Planet Foundation (Whole Foods Market's non-profit initiative), are bringing awareness to the poverty alleviation programs throughout the nation. ITO EN is one of the original partners with Supplier Alliance for Microcredit to fight poverty around the world. The Supplier Alliance for Microcredit is an alliance of natural foods companies that has collectively pledged $1.05 million to support microlending programs which offer small, collateral-free business loans to the very poor, with a focus on women. With a microcredit loan, an impoverished woman entrepreneur can start or expand a home based business and create the opportunity to lift herself and her family out of poverty. Socio-economic and planetary betterment is part of ITO EN's DNA from green tea health benefits research, recycling waste, to reuse of the elements if production (such as making vending machines and park benches our of recycled tea leaves). Click here for more about ITO EN's sustainability involvement. So on to the samples! The first tea I tried was the TEAS' TEA Unsweetened Pure Green Tea. Its flavor was very subtle, not as strong as the flavor from the brewed tea that I make. But the more I drank it, the more I liked it. I also tried combining this tea with some Kern's Peach Nectar, which made for a sweet drink, not unlike my Yum Yum Peach Tea. The second sample was the Low Calorie Blueberry Green Tea. That was just a little bit sweeter, yet with the same subtle green tea taste. I think my children would like this one a little better - and I would like it for them because it isn't too sweet! Would you like to try TEAS' TEA bottled green tea? It's available at Whole Foods Market as well as online. Or would you like to get it for free? Frugal Follies is holding a giveaway for two free bottles of TEAS' TEA! 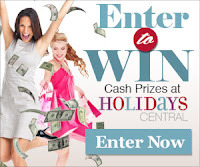 To enter, use the Rafflecopter below! The giveaway is open to US residents aged 18 and older. This giveaway will end on Thursday, April 19th, at 12:01 am Eastern time. If you are the winner, I will contact you shortly thereafter, and you will have 72 hours to respond. If you do not respond within that time, your entry will be declared invalid and a new winner will be chosen. Doing some spring cleaning? I have to get going with mine... If you need some cleaning supplies, use the coupons to help you save on them and get your home clean as well!